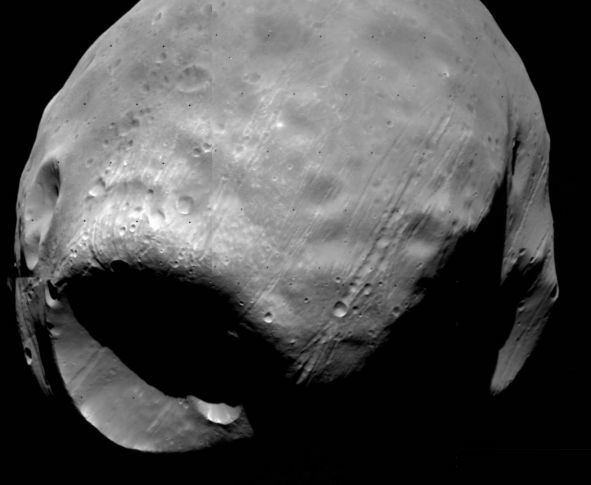 The first two "asteroids" seen close up were Mars' two tiny moons, Phobos and Deimos, as part of the exploration of Mars. These moons were first photographed by the American Viking mission in the 1970s using a telescopic lens. Successive Mars missions have also photographed and characterized these moons. The origin of these moons is actually still controversial. It was long thought that they are captured asteroids. However, this is not at all universally accepted because these objects orbit closer to the plane of Mars' equator rather than the solar system plane, and are in nearly circular orbits, whereby computer modeling is not clear about whether a captured asteroid's orbit could eventually take on such an orbit. Another possibility is that they formed from the same material in which Mars formed, or from material blasted off of Mars by other asteroid imacts. Scientists have deduced that both Phobos and Deimos are closest to the C1 and C2 carbonaceous chondrite classes of materials. Both asteroids are irregularly shaped. Deimos is roughly 8 km x 15 km in size. Phobos is 28 km x 19 km. For a size comparison, Earth's Moon is more than 3000 km wide (and spherical). Both Phobos and Deimos have come close to having been broken apart into smaller fragments. 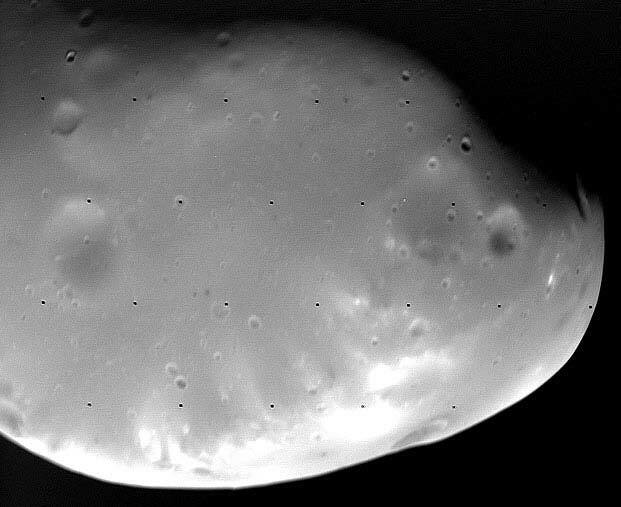 Deimos is U-shaped from one angle. Phobos has an 8 km wide crater -- almost half its width -- and is covered with cracks up to 100 meters wide which the powdery surface has subsided into, and which is lined with "beads" which are volcano-like craters with raised rims formed as the result of great quantities of steam blowing out from the heating of internal volatiles due to that impact. The surface gravity of Mars' moons is so weak that you could escape by simply jumping off of the moon with your legs. That is, if you found a good place to jump from, as they have fluffy surfaces and low densities (just around 2 grams per cubic centimeter).